The first day was remarkable. 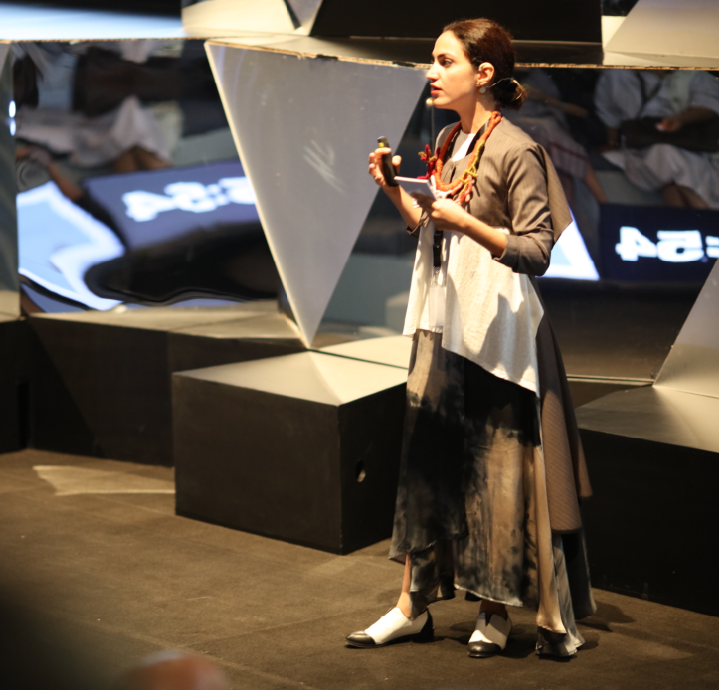 Rayya Marcos, a Lebanese fashion designer and winner of the Woolmark Prize for her collection Bird on a Wire, presented a stimulating lecture titled Call for Revolution. She explained her vision by asking “Why just change fabric? Why not make something new?” At Elevation Burger, we are aware that the burger has been around since the 1880’s. Hans Hess, Elevation Burger’s founder, was inspired by the concept of healthy eating and used creativity and passion in order to create something of his own. By using grass-fed beef and fresh produce, we have revolutionized the burger into something that fits the world’s consciousness of what organic food is and why it matters. The second day didn’t start out with a lecture, but with a Cross Cultural Diwaniya. Faisal Al Fuhaid, the creator, engaged a panel consisting of two influential bloggers (Mark and Ascia) and Dr. Skull (a psychologist) about how bloggers have the power to influence. We are inspired by global trend of leading a healthier lifestyle and encourage our guests to make smarter food choices. Like them, we believe that we have a social responsibility to live by example and use the power of influence in a positive way. We believe in supporting community development and innovative ideas, which was the cornerstone of Wajha’s lecture. Founded by Hussein Alazaat and Ali Almasri, Wajha change the façade of barbershops, bookstores, and grocery stores. Just like how we decided that opening a restaurant in Qurtuba wasn’t enough, we completely redesigned the building in order to create an original and eye-catching façade. We were also proud to see Abdulaziz Alhumaidi hosting his own lecture titled Paste. An architect by day but The Sound Social DJ by night, he kept the vibe upbeat at Nuqat and you can now hear his original music playing in Al Bidaa and Qurtoba. Day three’s agenda included an Interactive Game, but no other information was given so we were curious to see what would happen. Dr. Amar Behbahani instructed the audience to draw sketches based on keywords, swap them with their neighbors, and then stand up if they saw any similarities. When almost everyone stood up, she emphasized that “There is no such thing as copy paste, there is humanity.” All the sketches were later hanged outside at the entrance to remind us that our similarities are not a result of just mimicking, but part of human nature. Badr Ward, the CEO of Lamsa, presented a lecture called Old New Kid on the Block. His application reads out hundreds of Arabic books to children, and boasts 200 million downloads to date. He created the app because he believes that “this generation is responsible for the next”, and it is our duty to educate children through stories they can mimic and repeat. Elevation Burger, which also finds inspiration in the passion and originality of children, opened a restaurant at Discovery Mall because we share this revelation. We believe that by educating the community on how to make healthier food choices, and making those choices available, children will mimic their peers and elders and make choices that benefit their health. As we packed up our station on the last day, we gained a deeper understanding of ourselves and our role towards our guests and community. Can Copy/Paste be a positive thing? Certainly. We gain inspiration from global trends, children, our community– and implement that into how we serve our food and make a positive impact on the world.